5 minutes (1 block) walk to the beach! ☀️ THE NEW SWIMMING POOL IS NOW OPENED. We are experienced SUPERHOSTS!! We are proud of all our AWESOME REVIEWS from all our guests!! Read them. Don't leave your one vacation in the hands of NEW "hosts". Exceptional customer service is what you'll get on THIS vacation!!! Our newly remodeled townhouse from top to bottom has 3 bedrooms and 3 full bathrooms with a cute SUN SHADE covered private enclosed patio deck!!! This is a unique one of a kind patio in the entire gated complex. We are located in Gulfport Mississippi in a secured gated clean and beautiful neighborhood which is only a block from the soft sands of the beach. A 12-minute drive from the Gulfport/Biloxi airport. This newly remodeled townhouse is clean and spacious. Brand new STAINLESS STEEL kitchen appliances. 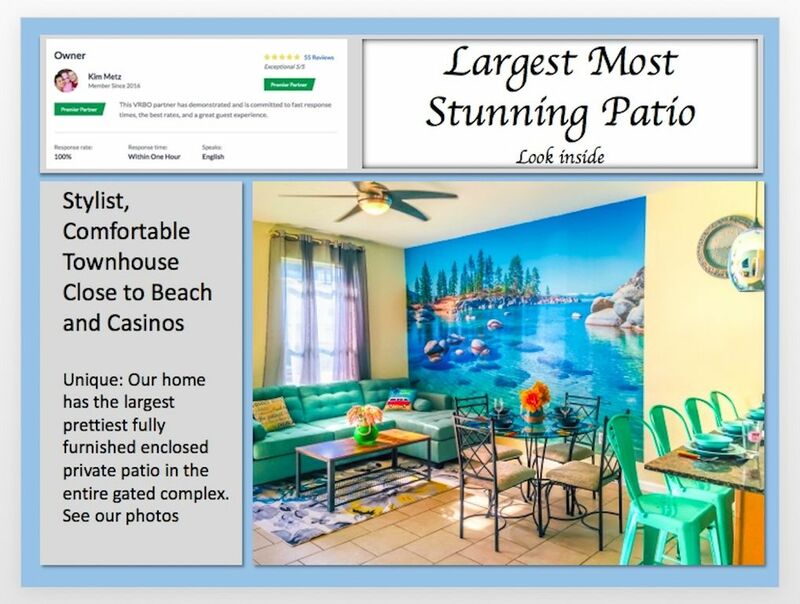 We offer free wireless, 4 Smart TVs with FREE ESPN, Hulu TV shows and movies, Netflix movies, Amazon movies, two new bike cruisers, a large authentic BEACHCOMBER MACSPORT beach wagon, 2 beach chairs, beach umbrella, kids beach toys, and many more amenities. We love our new clean and beautifully decorated home and we hope you and your family will too. We hope to see you soon. * Only $150 (not $200 like other owners) fully REFUNDABLE damage deposit; $150 refunded to you after you've checked out and no major damage was found. 1) Upstairs hardwood floor master bedroom has a brand new KING size bed with a quality & comfortable mattress and private full bathroom. A nook with super awesome round chair for relaxing and reading. Also included a 43-inch flat screen Smart TV, walk-in closet, new ceiling fan, and a door out to your own private balcony with table and chairs to relax and enjoy the morning sun with your cup of coffee. 2) Upstairs large hardwood floor bedroom has brand new TWIN-over-TWIN size bunk bed and a FULL-over-FULL size bunk bed that can comfortably sleep 4-6. It includes a 28-inch flat screen Smart TV, a large closet, a large private full bathroom. 3) Downstairs hardwood floor bedroom has a QUEEN size bed with quality & comfortable mattress. It includes a 32-inch flat screen Smart TV, dresser, ceiling fan, a closet and a doorway to a newly built covered patio with an enclosed fenced yard with a BBQ grill (charcoal) and a modern conversational table with 4 chairs and a dining table with 4 chairs for your relaxation and entertainment in the huge patio. * There are two full bathrooms upstairs and they are attached to the bedrooms. We provide bath, hand, and face towels. We also have SHAMPOO, BODY WASH and HAND SOAP in each bathroom. * There is one full bathroom downstairs next to the bedroom. * A stacked Washer and Dryer set is located in the bathroom downstairs. * The living room has a large comfortable sofa with a large 55-inch flat screen Smart TV and ceiling fan. * The full dining table set and additional 4 counter stools provide comfortable seatings for 8 people. * The kitchen is stocked with plates, glasses, coffee cups, pots/pans, utensils, toaster, blender, can opener, etc. * The beach is a short nice stroll from the townhouse. We have available the large authentic BEACHCOMBER MACSPORT beach wagon to tow your beach gears and toys from the townhouse to the beach. We have for your use 2 beach bike cruisers, 2 beach chairs, beach umbrella, and kids beach toys. We are an accommodating and family-friendly community and we hope you decide to visit our family vacation rental. We also have 5 more of the same size townhouses in this gated complex. So contact the owner, Kim, regarding renting one or more to accommodate large family gatherings. A few steps away from the beautiful clean outdoor swimming pool int the gated complex. Close to many casinos. Townhouse completely remodeled from top to bottom. All new furniture, beds, and accessories. We also 5 other same size townhouses in this gated complex. So contact the owner, Kim, regarding renting one or more to accommodate large family gatherings. 0.3 miles from the beach and ocean. Just 1 block walking from the townhouse. Central heating ventilation. Individual cozy blankets for each of the 6 beds in the closet. Warm throws available in the pantry closet. All 8 beds are made with fresh fresh linens at each new guest check in. Stacked clothes washing machine and dryer downstairs. Detergent provided under the downstairs bathroom sink. No garage. If you have a trailer of any kind, please contact owner in advance to make arrangement. Trailer are not permitted inside the complex. Clean towels and toiletries provided all 3 full bathrooms. Extra towels are provided in the upstairs hall closet. Open downstairs living entertainment space with living room, dining room and kitchen combination. Includes a large 55 inch Smart TV with Netflix, Amazon movies. Brand new stainless steel dishwasher. Dish washing detergent under the kitchen sink. Brand new stainless steel stove/oven with clean flat top range stove. A cook's dream! A Mr Coffee 10 cup maker available. Bring your own coffee to enjoy. Brand new unique toaster and small pizza oven combination. Salt and pepper are provided. Bring your favorite food and seasoning to cook up a meal. Enough dishes, bowls, cups, glasses, wine glasses, etc for more than 10 people. Well lit living space for dining and entertaining with new ceiling fan and variety of dimming lights to set the ambience. Comfortable dining seating for family meals. Balcony accessible directly from the upstairs master bedroom. Include two new comfortable chairs and table for enjoying the sunrise with your favorite cup of coffee. Plenty of water sports are available from various vendors along the beach. We provide 2 portable beach chairs for guests use. We provide 2 brand new adult cruiser bikes for guests use. Golf courses are available 4 miles away. Beautiful and clean community pool just steps away from the townhouse. Outdoor pool is heated by the sun. Pool will be closed during the colder seasons. Be immerse in our nature green beach house. This home echos extreme comfort and elegance. With your stay, your worries are carried away like the beach waves. Isn't this the reason you are vacationing anyways. Breathe. Close your eyes. Relax. Perfect for our spring break trip! It was very spacious, had all the things we needed, and a lovely patio! Short walk to the beach and very close to restaurants. Reasonably priced as well. Very clean and easy to access. Loved our stay! It’s more than good, it’s great!! I really enjoyed my stay, the place was amazing. Love the location, the host was great. The host has everything you can possible need, love the decorations. Just made me feel at home. 2nd time staying in Kim's Townhome. Everything is just as advertised . Clean, Comfortable and Inviting. Close to the beach and all the amenities the gulf coast has to offer. Kim is friendly and very accommodating. We are completely satisfied with our stay and look forward to returning. YOU'LL NEVER REGRET STAYING IN ONE OF THESE TOWNHOMES. Kim was great from beginning to end. She was accommodating and answered all questions that we had. Kim is the absolute best when it comes to having a hostess who responded promptly with anything we were inquiring about! Be immersed in our earthy Green Beach house. This home echoes extreme comfort and elegance. With your stay, your worries are carried away like the beach waves. Isn't this the reason you are vacationing anyways. Breathe. Close your eyes. Relax.